This article is the follow-up to Managing Low Back Pain with Exercise Here specific exercises to get you started with your recovery and prevention efforts are discussed. The list is far from complete, and the descriptions are not a replacement for working with a professional. Initially the intent is create some movement and gentle activation of the low back and surrounding area. Along with the physical aspects of the exercises, developing the neurological control and positive feedback from the troublesome area is equally important. Walking with a gentle arm swing is the precursor and accompaniment for these exercises, and prolonged sitting, as always, should be avoided. The first two may be done while still experiencing some pain, as long as they do not provoke more. It is very likely that they will actually reduce the pain and help with healing. 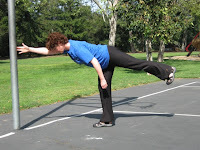 As movement becomes more comfortable, the purpose of the exercises is developing strength and stability in the low back, so it can resist movement, and strength and mobility above and below the low back(hips and middle(thoracic) spine) so that those areas move instead of the lower(lumbar) spine. Stand with the feet close together, legs nearly straight and equally supporting your weight, and move your hips in a circle a few times in one direction, then the other. The spine can gently curve as the hips move. Next shift your weight to one leg and do a few circles around that side of the hips in each direction, then do the other side. In the Cat position, emphasize stretching the low back, and rotating the hips under you to increase the low back stretch. Don't try too hard to stretch the upper back. In Cow, the emphasis is the opposite, minimizing the lower spine bending but trying to extend the upper spine and open the chest. Move slowly between the two positions about ten times, holding each for two to three seconds. This is where the exercises include building strength. It will be helpful to understand that back injuries are often associated with too much motion in the low spine, and that the primary role of the core muscles can be considered as maintaining spinal alignment. 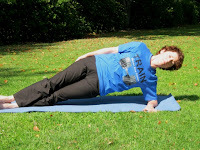 Therefore, exercises that train the core to resist movement in the low spine are needed. 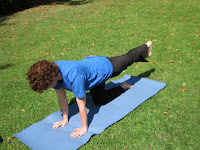 Plank is simply holding the body straight in the familiar "top of a push up" position. No movement is involved. 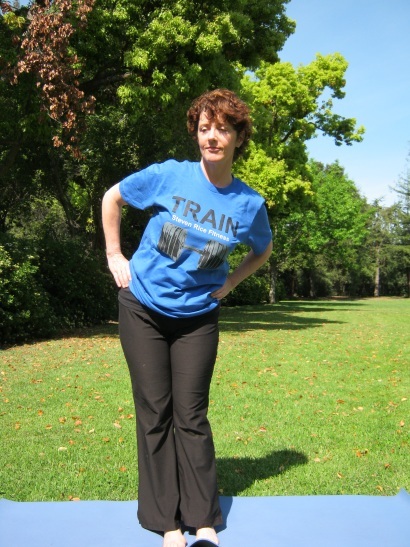 Start in the hands and knees position with a neutral spine, as shown above. Do a slight cat tuck at the waist, and step one foot back, then the other. Keep the hips up, the tendency is for them to be too low. Work up to holding for ten to fifteen seconds, resting a moment, and repeating several times. If Plank is too difficult to do at all, start by leaning against a table, then try the edge of a chair, until it can be done on the floor. 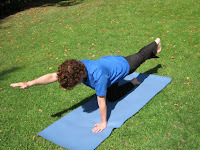 Side Plank is very similar except for the arm position and the direction you face. The body is held in a straight line, resisting the pull of gravity trying to bend you sideways. Two easier versions are shown. The spine is held steady in the neutral position shown above, and the low back muscles are engaged to maintain alignment. The glutes are worked, plus the shoulders. The first level is to extend one leg. When that is not difficult, also extend the opposite arm. Try to hold the leg straight behind you, and keep the hips level. The weight of the leg will try to turn your hips and spine, and you are strengthening the muscles that hold them steady. Although not strictly needed for low back training, it is good to pull the shoulder toward the spine and not to let it hang down. 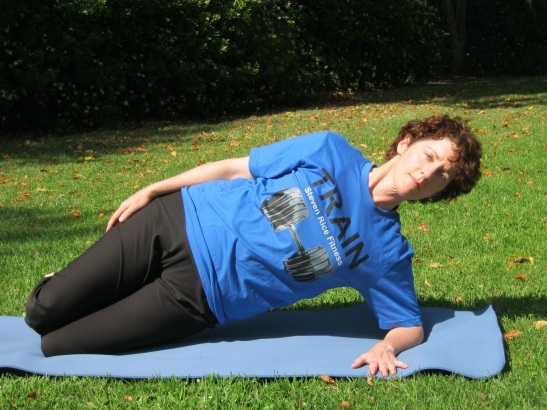 Hold the position for one to two seconds, lower the arm and leg, and repeat. Do three sets of ten to fifteen repetitions when able. Bridge works the low back, glutes, and hamstrings, and the single leg version works those same muscles on one leg even more while simultaneously developing hip stabilization. Try to fully extend the hip of the supporting leg or legs, so the thigh is in line with the torso. 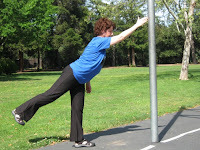 In the single leg version, the elevated leg can be kept straight and slowly lowered to the ground for extra challenge. Follow the same lift, pause, repeat protocol as above. 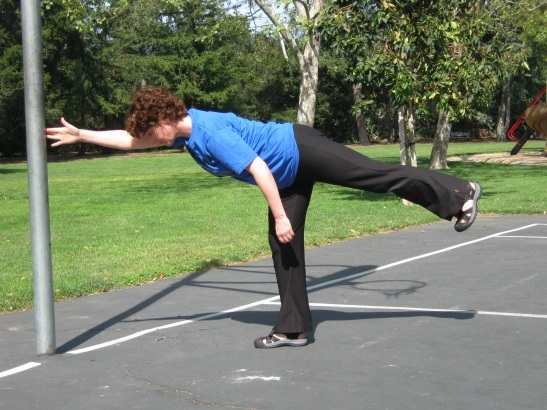 The Stand and Reach is an easier version of the final exercise, and an important step to learning good alignment. The full posterior chain is engaged, primarily the glutes and hamstrings, but also the back and shoulders. Not allowing the spine to round forward is critical, and a slight arch(backward extension) is fine to be certain to avoid any rounding. Start with the body straight and tall, then bend at the top of one leg with just a slight bend in the knee. This is known as a "hip hinge." The opposite arm from the standing foot goes forward. Having something to reach for and touch encourages the idea of maintaining a long spine, gives you a way to be consistent, track your progress, and offers a support if needed. Keep the hips level- the tendency is for the hip on the side of the lifted leg to rotate up. Reach, stand, repeat. The Single Leg Deadlift is included to show a transition to strength training that can be progressed quite far, but this exercise really needs to be taught by a knowledgeable professional before advancing. Correct form becomes very important. Instead of reaching forward as in the Stand and Reach exercise, the arm now holds a weight which moves straight down. Pivot at the top of the standing leg, slightly bend your knee, and allow no bending of the spine whatsoever. Something solid should be at your foot to tap the weight against. I discourage just stopping in the air, and the weight should not go any lower than is possible without rounding the back. 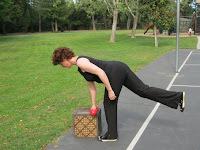 Note that the hips move backward, and the weight should touch a point above and just a few inches in front and to the inside of the end of the big toe. 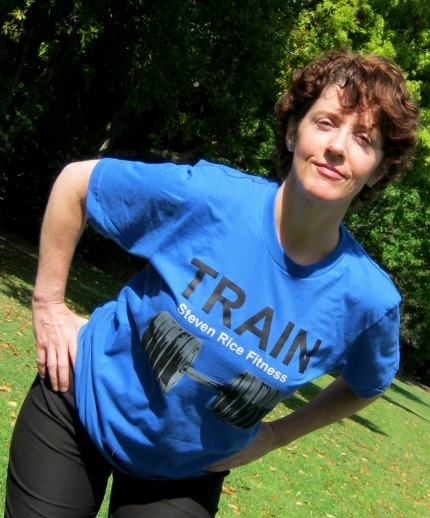 Don't reach downward with the arm, keep the shoulder pulled back and let the weight just hang. Each repetition should distinctly start and stop from a tall, fully standing position. The easier exercises can be started soon after an onset of pain, after clearance from a physician. Gradually add the more challenging exercises and variations as rehabilitation for injury and for future injury prevention. Initially the exercises are done daily or even more frequently, then as you progress to more difficult variations they should be done every other day. 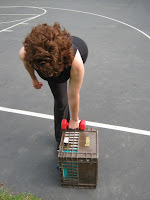 At the beginning of injury rehabilitation or starting a new exercise program move slowly and work on learning good form. After any injury symptoms are gone and the exercises have become easy, they can be done more briskly as a warm-up to more difficult strength training. Some other strength building exercises to explore are farmers walks, the Pallof press, other types of deadlifts, and squats. 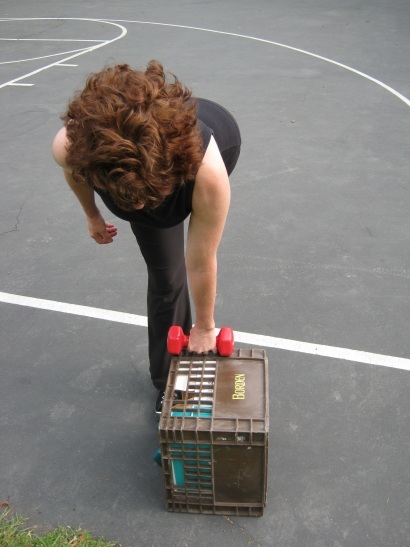 Any whole body, functional exercise is helpful because the low back will automatically be included. Remember that the low back is at the center of the body and should be trained to efficiently and safely transmit forces from the the top(arms) to the bottom(legs). Always put good form and control first. Quality of movement is key to preventing injury and enabling safe progression to more rigorous training. Developing serious strength should be your goal- don't stop progressing when you think you've healed. Strength training has many more benefits to health and quality of life than managing low back pain. The exercises are demonstrated by Palo Alto's most fabulous yoga teacher, Mimm Patterson. 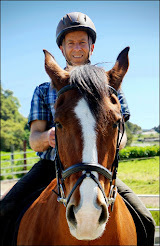 Mimm's wonderful blog on yoga and life is Practically Twisted.